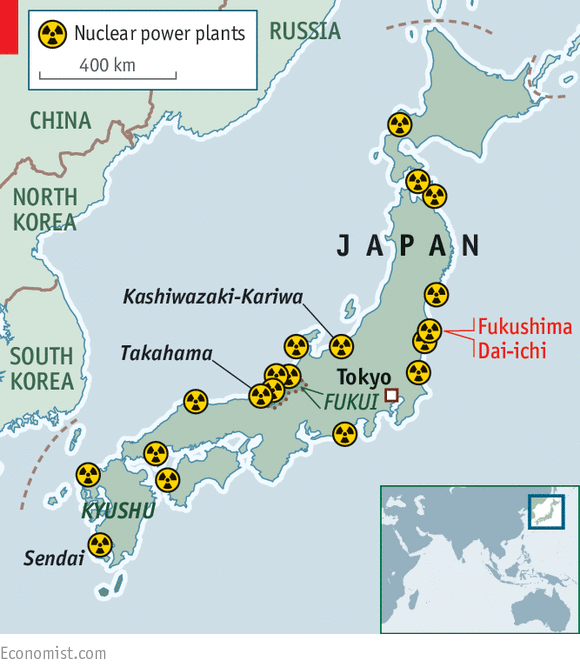 Why is the danger to nuclear power plants not mentioned? But this year, despite Japan’s accumulating radioactive wastes and continuing Fukushima nuclear mess – mainstream media does not mention the nuclear risk. All part of the propaganda buildup for the 2020Olympic Games, including the lie that the Fukushima nuclear wreck is now safe. Is Fukushima capable of withstanding a super typhoon? , DW 2015 “….. Apart from physical damages to construction equipment, we could expect radioactive isotopes from contaminated surfaces being washed away and transported into the groundwater or the sea. Over the past days, the concentration of radioactive substances in the groundwater has increased significantly at some of the plant’s measuring points and, according to TEPCO, this was caused by the recent heavy rains. TYPHOON Jebi will make landfall in southern Japan on Tuesday as damaging winds, flooding and mudslides are expected to hit the country. But where is the typhoon now and will it hit the capital Tokyo? Typhoon Jebi smashed into Japan on Tuesday, barreling across the mainland at speed in a northeasterly track. Japan issued evacuation advisories for more than 1 million people and cancelled hundreds of flights in the face of extremely strong winds and heavy rain hammered the country. AccuWeather senior meteorologist Adam Douty said: “Damaging winds and coastal flooding may be the most significant impacts with this storm. Where is Typhoon Jebi now? Typhoon Jebi is currently located just north of Kyoto, traveling back out into the sea in a northeasterly direction. The storm avoided a direct hit with capital Tokyo, but the city is still expected to bear the brunt of winds of more than 60mph. Osaka and Kobe also took a hammering from the storm when they were struck earlier on Tuesday, after Jebi moved in from Honshu. The storm made landfall on Shikoku, the smallest main island, around noon. Jebi then raked across the western part of the largest main island, Honshu, near the city of Kobe, several hours later, heading rapidly north. Wind gusts of up to 208 km/h (129 mph) were recorded in one part of Shikoku, with forecasts for gusts as high as 216 km/h (135 mph). Around 100 mm (3.9 inches) of rain drenched one part of the tourist city of Kyoto in an hour, with as much as 500 mm (20 inches) set to fall in some areas in the 24 hours to noon on Wednesday. The Meteorological Agency advised the public to be on the lookout for even more flooding and mudslides, as well as high tides. Prime Minister Shinzo Abe told a meeting of the government and ruling parties: “We have seen typhoons and torrential rains. “The government will do its utmost to prevent disaster. Jebi – whose name means “swallow” in Korean – was briefly a super typhoon and is the latest harsh weather to hit Japan this summer. Japan has been hit by extreme weather since the beginning of July and western parts of the country have been left devastated by flooding and landslides, leaving more than 220 people dead. typhoon Jebi’s course has brought it close to parts of western Japan hit by rains and flooding but the storm was set to speed up after making landfall, minimising the amount of rain that will fall in one place. The country has experienced record-breaking heat as well as floods and landslides. It’s that time again. Time for tropical storms and hurricanes, and time to remember the increased dangers of nuclear power stations (orange skulls on map) during severe weather, which can lead to power outages and power surges, as well as storm surges, flooding and more. Nuclear power stations are dangerous and unreliable electricity sources in extreme weather. One of the most dangerous, and often ignored, things about nuclear energy is that nuclear power stations always have need for backup energy supplies for cooling of the nuclear reactors, and spent fuel pools, as dramatically demonstrated by the never-ending Fukushima Daiichi nuclear disaster. If they lose offsite power, then they are dependent upon backup generators, which can fail to start, fail once started or run out of fuel. In Louisiana, a thunderstorm led to a scram at River Bend Nuclear Power Station due to a power surge, followed by a loss of cooling, supposedly the next day. Loss of cooling can lead to a nuclear meltdown, if not corrected quickly enough. 4 Sept 18, Kyodo,, Utilities that operate nuclear power plants stopped funding the reprocessing of nuclear fuel in fiscal 2016, their financial reports showed Sunday, a step that may affect resource-scarce Japan’s nuclear fuel recycling policy. The 10 utilities, including Tokyo Electric Power Company Holdings Inc. and Japan Atomic Power Co., apparently halted allocating reserve funds for reprocessing costs due to the huge expenses linked to building the reprocessing facilities, sources said. The government, along with the power companies, has been pushing for the reuse of mixed-oxide, or MOX, fuel, which is created from plutonium and uranium extracted from spent fuel. While Japan has not changed its policy on spent fuel reprocessing, the outlook for it has remained uncertain since the 2011 Fukushima disaster. At the same time, the government’s latest energy plan in July also stated for the first time that disposal of spent MOX fuel as waste can be considered. If MOX fuel cannot be reprocessed, nuclear fuel can only be reused once. For the reprocessing of spent MOX fuel, the utilities had allocated about ¥230 billion in reserves as of March 2016. Currently, only two reactors at Kansai Electric Power Co.’s Takahama power plant, one reactor at Shikoku Electric Power Co.’s Ikata plant and one reactor at Kyushu Electric Power Co.’s Genkai power plant use MOX fuel in so-called pluthermal power generation. As Japan has decided to cut its stockpile of plutonium, the government and utilities aim to increase plants for pluthermal generation. But if spent MOX fuel is not reprocessed, it would be considered nuclear waste, raising concerns over how to deal with it. Japan Nuclear Fuel Ltd. — in which power companies have invested — has been pursuing the construction of a spent nuclear fuel reprocessing plant in northeastern Japan as well as a MOX fuel fabrication plant, with the costs coming to about ¥16 trillion. But a series of problems has resulted in their delay. When operational, the Rokkasho plant in Aomori Prefecture, key to Japan’s nuclear fuel cycle policy, can reprocess up to 800 tons of spent nuclear fuel per year, extracting about 8 tons of plutonium. With this setback, if new MOX reprocessing plants are to be built, it would be hard to secure further funding. This is the first part of a series of testimonies. Please share widely. This video and copy is creative commons with normal attrib. NOTE ; During the early months of the disaster a health survey was conducted by a Japanese nurse who had worked in the Chernobyl contaminated regions of Ukraine and Belarus. No other survey of its type was done by the Japanese authorities. Here is the video from a Japanese TV station that compiled the statistics and the discusssion that followed (In Japanese but with English subtitles). This video helps confirm the claims of the testimony from the 2Sept 2018 video above. A health survey in Fukushima covered up by the Japanese Media?